Guardian Pharmacy of Maine serves pharmacy patients residing in nursing homes, assisted living communities and rehabilitation facilities. Guardian is Maine’s largest privately-owned long term care pharmacy. 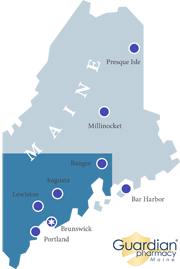 Our market area extends from Bangor south to Maine/New Hampshire border. Guardian Pharmacy of Maine provides services from a complete-service perspective, not just pharmacy dispensing. The qualitative facility management objectives we seek to reinforce are efficiency, superior care, staff proficiency and consistency of management. We work directly with facility nursing staff, and our services are designed to ensure positive resident outcomes, the highest level of clinical care, regulatory compliance and cost management. Our Management Team believes responsiveness, efficiency, accuracy, and cost of pharmacy services impact every aspect of residential care. We would like an opportunity to partner with your facility as you care for long term care residents. To meet with our management team and/ or schedule an onsite visit, please send an email here. The Guardian Pharmacy of Maine management team has many years of experience in Maine and in long term care pharmacy. Our President and Owner, Courtney Doherty Oland RPh, MBA, FASCP, has extensive experience in long term care pharmacy in Maine. Before joining Guardian, she worked for both an independent provider and a large national provider as a consultant pharmacist and account manager. She brings a strong background in long term care pharmacy operations, and focuses primarily on ensuring customers receive superior service. For additional information or to arrange an onsite visit, contact Courtney. Our Director of Pharmacy Operations, Amy Kelder Enos, PharmD, CGP, Amy is a graduate of the University of Connecticut College of Pharmacy with a Bachelor’s degree in Pharmacy Studies and Doctor of Pharmacy designation. Amy was drawn to geriatrics and long term care pharmacy as a student pharmacist involved with the Connecticut chapter of the American Society of Consultant Pharmacists. Amy moved to Maine upon completion of her studies and obtaining her pharmacy degree. She joined Guardian Pharmacy of Maine in 2007. After working for Guardian as an operational pharmacist and a consultant pharmacist for three years, she became the Assistant Director of Pharmacy, assisting senior management with managing operational workflow and overseeing the sterile, non-sterile compounding department. In 2012, Amy became a Board Certified Geriatric Pharmacist (BCGP) to better serve Guardian’s primary patient population. Amy also served five years as a voting member on the MaineCare (Medicaid) Drug Utilization Review committee. Tracey Taylor, CPhT, is our Marketing/Customer Relations Representative, she has 18 years of experience in long term care pharmacy, proficient in all the functional area responsibilities of a pharmacy technician. She has entered, packaged and delivered prescriptions, mixed IVs & compounds, managed operational pharmacy technicians and focused on inventory and operational best practice management for 9 years before obtaining her certification in 2010. Tracey’s primary focus for the past 6 years has been building relationships with and providing support to our new and existing customers. She works closely with clinical and operational pharmacy staff ensuring a high-quality pharmacy experience is not only met but exceeded.